Gail Doane is returning to Nashville. We will host her for a four-day master class January 25 - 28, 2016. Gail will teach her Tailored Dress Coat with matching Smocked Dress. Join Trisha for a fun filled day of sewing and make this precious casual dress which is "Sweetness Personified". This dress has two inverted pleats in the front and back. The pleats are top stitched in place at the upper edge adding detail and also making the dress more form fitting at the same time. It has a round yoke neckline that closes with a large decorative button. 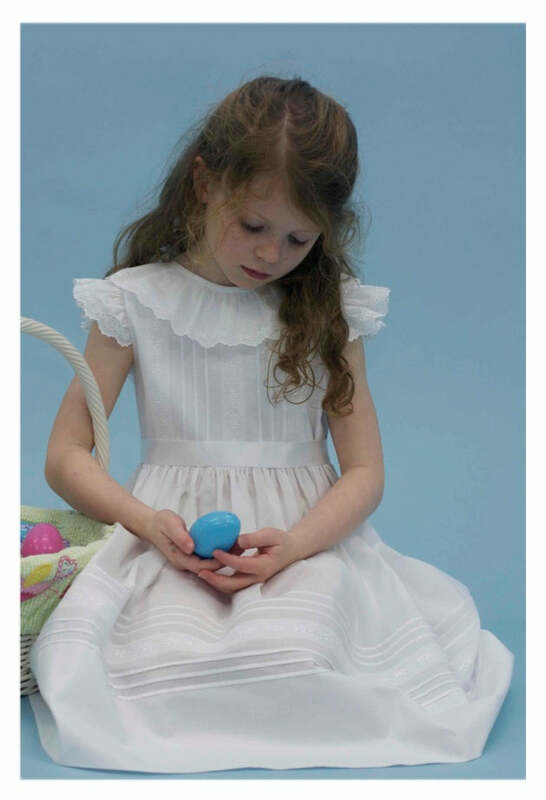 A soft ruffle peaks out at the lower edge of the yoke to give this dress a very feminine look. The armhole edges are also embellish with the same sweet ruffle. The ruffles come to life when they are accented with a beautiful floral print double fold bias that has a sweet crochet scallop edge. This garment is available in sizes 2 - 10 and if desired, could easily become a top for the larger sizes. Trisha has designed a wonderful Heirloom dress for your child. As the name states, it is heirloom made easy. The techniques used will save lots of time compared to most heirloom garments. The bodice consists of Swiss Embroidered Insertion with Entredeux and tiny lovely tucks. The neck and armhole edges are accented with gathered Swiss embroidered edging. The skirt section of the dress mirrors the bodice with the Swiss insertion and tiny evenly spaced tucks. The dress has a sash that ties in the back if desired. Enjoy spending the day with Trisha and learning many heirloom sewing techniques while you create your masterpiece. The knowledge you acquire making this garment can be used over and over again in future garments. This dress is available in sizes 2 - 10. To register for Mini Sewing School, please call us at 615-292-1746 to reserve your spot. 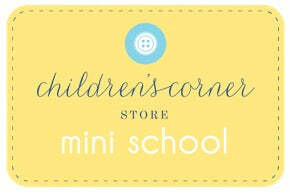 Feel free to call or email us at info@childrenscornerstore.com with any questions you may have about Sewing School. Mini School is $230 with an additional kit fee for each class. A non-refundable deposit of $10 is due at registration. The balance of $130 is due on March 10th.